Murder At Buoku, Near Chiraa! GRAPHIC PICTURE!!!! 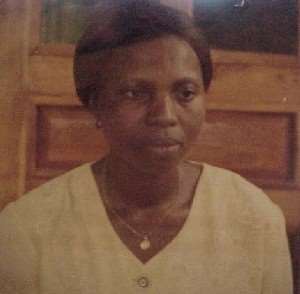 The mortal remains of the late Dora Abena Sakyiwaa who was allegedly murdered in the Buoku forest Reserve on March 6, this year, has been exhumed for a befitting burial at Techiman, her home town by her relatives. The body which was examined by a pathologist from Kumasi certified that she was murdered but was hanged to deceive the public that the deceased committed suicide. The body which was by then in a decomposed state could not be sent home but was allowed to be buried at the spot where she was murdered. The brother of the deceased, Richard Manu upon his persistent demand for befitting burial for the sister, was granted approval by the various authorities in charge and the body was carried home yesterday.